In the evening, J noticed something funny was going on with his watch. We had been discussing when we thought this baby would come out! The date number on his watch was slowly switching from 3 to 9 and back. Back and forth. It did this several times before J called me over to take a look. We asked each other “Is this some sort of sign? Is someone trying to tell us something?” We started saying out loud “All right! We get it! Baby is coming on the 9th! You can stop messing with the watch now!” The date number stopped changing. My due date came and although I was really hoping to have the baby, I knew that I would go over. I had known that I would go late for the whole pregnancy and had the date June 12th in my mind. Still, the due date was worth noting and I sent a picture out to family and posted on mt blog. We spent the Saturday at home, doing general household chores and light cleaning. That night, after our evening walk with our dog, I noticed some cramping and back spasms starting. They were painful, but not overwhelming and I could breathe through them. This excited us a little bit because we knew something was happening, but we also decided not to get TOO excited because this was probably just prodromal labor. The back spasms continued all night long, lasting about a minute and anywhere from 10 to 20 minutes apart. I couldn’t sleep through them and trying to lie down on the bed through them was excruciating. I ended up feeling one coming on, standing up and either swaying through it next to the bed or kneeling beside the bed and rocking my hips back and forth. I found that if I focused on my breathing I could get through them much easier. The pain would peak around breath 4 and the contraction would be over by breath 11 or 12. After each contraction I would go to the bathroom and then try to sleep again. The back contractions lasted all day and all night. Baby was also wide awake and kicking or squirming the majority of the night as well, making it difficult to sleep even when I wasn't having contractions. I spent a lot of time on the yoga ball bouncing through them and we got our car seat inspected and went shopping a bit. Having contractions in the checkout lines at the stores was a little intimidating, because I didn’t want people to notice that I was in pain. That night, I sent an email to the other grad students in my lab telling them that I would not be in the next day. Even if this wasn’t labor, I couldn’t imagine trying to drive myself to Ann Arbor through these spasms that were now consistently 5-10 minutes apart, although not any longer than a minute and no more intense. My alarm went off at 6:30am and I asked J if he was going to go into school that day. He debated about it and eventually decided that he wasn’t going to go in and left to send an email to his administrator. I had another contraction and when I went to the bathroom I found that I had lost a small chunk of my mucus plug. I called J back in and told him what a good decision it was that he was staying home: this was definitely labor! It was a rainy, cruddy day so we took a video to document our progress and called Kate, our midwife, to let her know what was up. We decided that we’d call her again when we wanted her to check me for dilation and set up. All morning we sat around the living room, watching TV and surfing the internet. I would sit on the couch with a pillow before me and the yoga ball in front of that. When a contraction was coming, I would drop to my knees and hang over the yoga ball, rocking back and forth and trying to relax through the spasm. 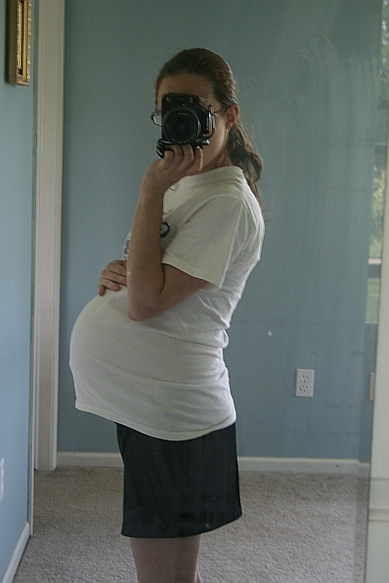 All the contractions were still in my back, so we were pretty sure the baby was positioned posterior. We called Kate and she suggested we work through the positions described on www.spinningbabies.com, which we did. 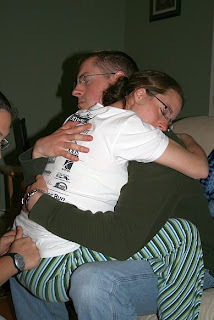 Some of those positions called for me to lie on my side or back through contractions, which was really hard as this made the pain much worse. I would ask J for counter-pressure on my tailbone during contractions, doing this for what ended up being 30 hours was something he got VERY tired of. I took a bath to help me relax through the contractions and the warm water did help to ease the sensations. After a while, though, I got very sick of being in the water and decided to get out. I also didn’t want labor to stall, so I figured every contraction I had and moved through would get me closer to having this baby. We called Kate to come over around 3:30pm after contractions were increasing in frequency and intensity. Unfortunately, at that time we were also under a tornado watch and a strong storm was just about to burst over our house. We laughed to each other that the baby was going to be born during a tornado down in our basement. We moved down into the basement for a time while the tornado sirens were going off. A little after they stopped, Kate came over and started to set up everything in the bedroom for the birth. J helped her out and I took another bath. She told us we were doing great and to keep trying the Spinning Babies positioning techniques to help turn the baby and stop the pain in my back. She cautioned us to try to conserve my strength and to let J help me as much as possible through contractions. Then she left to get a nap and dinner with her family. She would be back when we thought we needed her to be there. I only ate some smoothie left over from the day before at the bequest of J and Kate. This is when things begin to get fuzzy for me and I can't quite remember all the details due to my trip to LaborLand. I do remember that we called Kate back around 6:30 and asked her to check my dilation. She asked what number would make us disappointed and I said “Anything more than 1 cm would be good.” She laughed and said that gave her lots to work with. In my mind, though, I was really hoping to hear something like 5 or 6 cm, just because I was working so hard and trying to relax and open through these contractions that I should have made SOME progress, right? Kate checked me and it was very uncomfortable. She said that I was a 2.5-3, fully effaced and my cervix was anterior. She could feel the baby’s head and everything seemed good. I was a little disappointed to hear that number, and it didn’t make things any better when the next contraction was more intense due to the vaginal exam. Kate said we were doing great and that we were definitely making progress, as several things had to happen before the baby could come out. I had already finished effacing and moving my cervix posterior to anterior, now all I had to complete was dilation and then we could push this baby out. That gave me a little hope, but I was still getting tired of the pain. After this I have no real concept of what time it was when things happened. I know Keisha, our midwife’s apprentice, showed up sometime later that evening around 10pm. I remember having contractions out in the living room while J, Kate, and Keisha talked and laughed, but I was completely in LaborLand and couldn’t pay attention to the conversation (something about bats and maple syrup and fungus?). I remember asking at one point how far apart the contractions were and being told 5-7 minutes. This surprised me as I thought for sure they were at least 20 minutes apart and I was stalling out. At midnight, J wanted me to be checked again but I resisted. I was afraid that I wouldn’t have made any progress and I didn’t want to hear it. I thought if I could just have an hour of really good contractions I could make some real progress and feel better about the number. Finally, at 1 am, I gave in and asked Kate to check me again. This time I was a 5.5-6 and that made me REALLY disappointed. I thought for sure that I would be further along than that. Kate also told us that the baby’s head was no longer engaged directly on my cervix, it was slightly tilted, which was slowing things down. However, she was fairly certain that the baby had rotated to an anterior position by this time and the pain I was feeling in my back was from a little elbow that was stuck around my tailbone. She suggested that we go back to trying the Spinning Babies positioning techniques, especially ‘The Dangle’. That is the worst position EVER. J and I had tried it earlier in the afternoon but I wasn’t able to have a full contraction through it as the pain in my back got SO INTENSE. Now that Kate and Keisha were here, I was able to dangle on J’s lap while they applied counter-pressure to my back to make things bearable. Then we got into the shower thinking that might help and it did, to a point, until I got sick of being in the water again. Then I told myself I wanted to have the baby by 6 am so that the pain would go away. After J went into the bedroom for some rest, I slow-danced with Keisha during contractions and Kate gently rubbed my back. The baby had moved down enough that there wasn’t any actual ‘pain’ in my back, just the residual spasm. I remember asking them how much longer they thought I had, as I was getting pretty exhausted and I knew I still had to push the baby out. Kate replied that she thought I was in late transition and that gave me a little hope as everything I had read about transition was that it feels horrible and hopeless and awful but that in actuality it passes pretty quickly and then it would be time to push the baby out. I don’t know how long I was in the darkened living room with Kate and Keisha, rocking through contractions. They gave me some arnica sometime in there to help with the bruising they knew I had from all the counter-pressure and also reminded me to eat and drink something between contractions. I remember Keisha remarking after one contraction that there were deer in our backyard, a whole herd of them. I could hear the birds starting to sing and knew that it was the morning of the day my baby was going to be born. I can't remember when J woke up, but shortly after that I asked to be checked again. I was starting to feel that I had to push with a contraction, although it felt more like I had to poop than anything else. This time Kate said I was 8.5-9 with a little lip of cervix left. At this point I knew I needed some help to get things moving along before I lost all my strength, so I asked her to rupture my membranes. I had initially planned to go all natural, without any interventions, but I knew I needed to get things moving along. On my next contraction, Kate broke my membranes and I felt a big gush of water spill out and onto the blue pads they had lined the bed with. I immediately asked if the water was clear and Kate told me there was no meconium, which made me feel better. The baby's heart tones had stayed consistently in the 140-150 range throughout the night and they continued like that for the rest of labor. I think they checked heart tones a lot more frequently after my water broke. The contractions after my water was broken were more intense than before and strange: they were part contraction as I had been having but another part of it seemed to be my body pushing. I resisted the urge to push for as long as I could because I didn't want that last lip of cervix to become inflamed and slow labor even more. Still, at times, I just had to push and would groan through it as my whole body contracted. I don't know how long it took before I was ready to push, but thinking back on it I don't think it was very long. Once I was pushing, things seemed to move faster for a time. J has told me that I began pushing at 9 am and the first hour went really well. I pushed on my left side, on my back, on hands and knees, on the toilet. It was during a contraction on the toilet that I lost control for the 2nd time and started to panic. It was so intense and I let it get ahead of me. I started making higher pitched noises and clutching at the cabinet above the toilet. Keisha came into the bathroom and helped talk me through that contraction, for which I was really grateful. During this time, Kate was concerned about my tissues swelling and she and Keisha did a lot of manual support. Keisha would hold one leg high while Kate would push on the upper part of my hip to help open the pelvis and allow the head to pass through. J gathered supplies for them and applied cold compresses between contractions. Eventually, Kate grabbed my hand and told me "Feel here, it's your baby!" I could feel the head about a knuckle's length inside. Kate, Keisha, and J kept telling me "She's coming! The baby's coming! I can see her head! You're doing great!" Throughout the labor Kate and Keisha were convinced the baby was a girl, so they kept saying 'she' and J joined in. Kate helped me direct my pushing and Keisha would remind me during contractions to push out through my bottom and to relax everything else. Between contractions, they would have me sip from a cup of Powerade. It was orange and tasted just like Tang. I love Tang. I would push and push during contractions, making all sorts of noises until I couldn't push any more. Between contractions I would try to get my breathing under control, sip some Tang, and beg them to let me put my leg down. My hip and tailbone would spasm in pain between contractions which was the worst part. Pushing itself was hard work but didn't hurt. When the baby began to crown, they told me to hold the push there and allow my tissues to stretch and to breathe through the burning. I don't remember feeling any burning sensation. I do remember feeling hopeless, like the baby was never going to come out, no matter how hard I pushed. I think I asked once "How much longer?" with some desperation. This baby was never coming out and I was going to be in pain forever. J told me later that the first hour of pushing went really well and that I made lots of progress. It was enough that Kate said to him that we should have the baby very soon. After that, though, I must have exhausted myself, because there was another 2 hours of pushing before he would be born. J says that it was discouraging for him to see the baby's head be pushed to the same point at each contraction only to slip back inside when the contraction ended. Kate told me later that she considered an episiotomy near the end because it didn't seem possible that I could get the head out when the tissues were so swollen already. When I began pushing, Kate told me to pay attention to the sensation after the head came out and to really feel the body slip from mine. I remember pushing and pushing and pushing and screaming and groaning and making all sorts of horrible noises while hearing encouragement from everyone when all of a sudden there was a feeling of release of pressure and the head was out! THANK GOD. Even though I knew it would take until the next contraction for the body to position itself to come out, I still kept pushing. I wanted that baby out NOW, DAMMIT! J was there and caught the head. The cord was wrapped around the neck three times and around the shoulder once, but was easily slipped off and before I knew it, the little wiggly body was out and there was a screaming person on my chest. J says that he was so convinced that the baby was a girl that he didn't even check for gender, just looked to see if there were 10 fingers and toes. Finally, Kate said to him "Congratulations, Daddy: you have a son" I looked up then in time to see J say "It's a boy!? Really!?" with such a look of joy and wonder on his face. The only other time I'd seen that look on his face was on our wedding day. He teared up a little bit and was beaming with pride. He grabbed the video camera and took a quick video of us naming Ben and soothing him when he was just minutes old. Kate and Keisha were busy cleaning everything up while we waited for the cord to stop pulsing, then J got to cut the cord and deliver the placenta. That was pretty gross as a lot of fluid came out with the placenta. A lot of this time is blurry to me as I was plain exhausted and was just paying attention to the screaming infant on my chest. After a short time, Keisha got everything ready to weigh him. He weighed in at 8 lbs even and was 20.5 inches long. Keisha dressed him in the outfit that J was brought home from the hospital in back in 1984. That was a pretty nice touch that we could pass that outfit on. Kate sutured me as I had torn (2nd degree) during the very last part. After everything was cleaned up, Keisha brought me a mug of tea and Kate brought us yogurt with bananas and strawberries for our first breakfast as a family. J and I ate together in bed while Kate and Keisha finished cleaning up the house and then they left us around 3 pm. I'm very glad that I was able to have the homebirth I wanted. While it was not exactly what I had envisioned, I'm happy that I worked through everything and had a drug-free, natural birth. I did wish for an epidural and drugs during the peak of labor, but thinking back on it I'm not sure that they would have helped and may have even lengthened my labor. In the end, this was the birth I was meant to have. 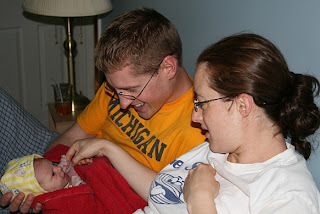 When I wrote this birth story, Ben was almost 3 weeks old. We had some issues with breastfeeding and impetigo, but things started looking up now and getting better every day. He's the most beautiful person I've ever seen and I fall in love with him more and more every day. I can't believe that we shared a body for 9 months and now he's here in the world. It doesn't seem possible on the one hand but on the other it seems as though he's always been here. 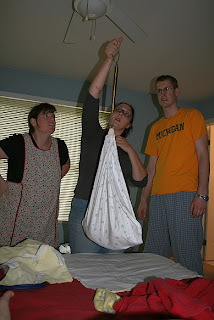 Congrats on your amazingly awesome homebirth and your little man. You did phenomenal! Thank you very much! This site has been inspiring to me in so many ways. I wanted to share my experience and hopefully it will help some other mama.